‘Waterfall of Echoing Voices’ in Sindarin, an elvish language in the works of JRR tolkien. 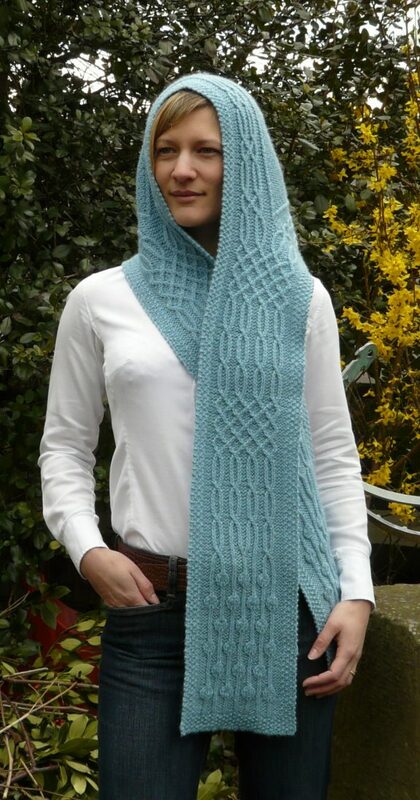 Reflecting this name, the scarf features a cascade of Celtic-style twisted stitch cables. 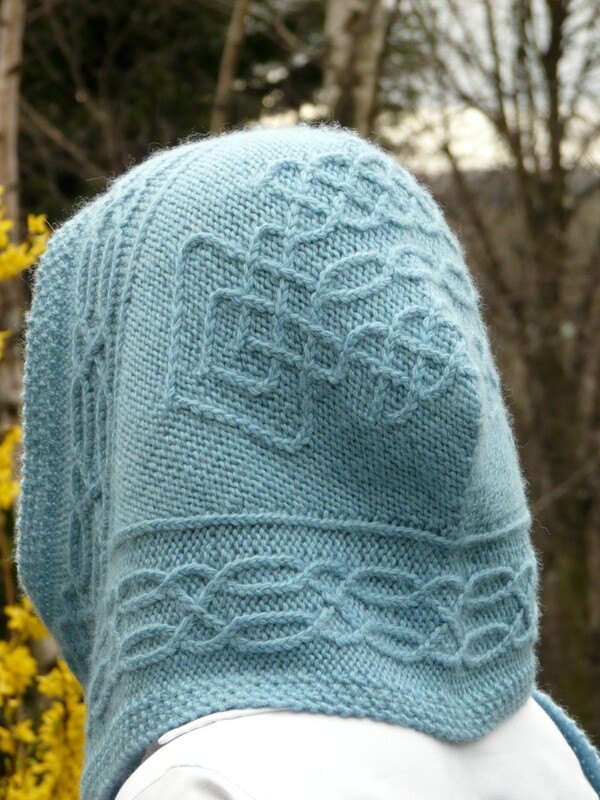 The hood section also features a decorative celtic knot. 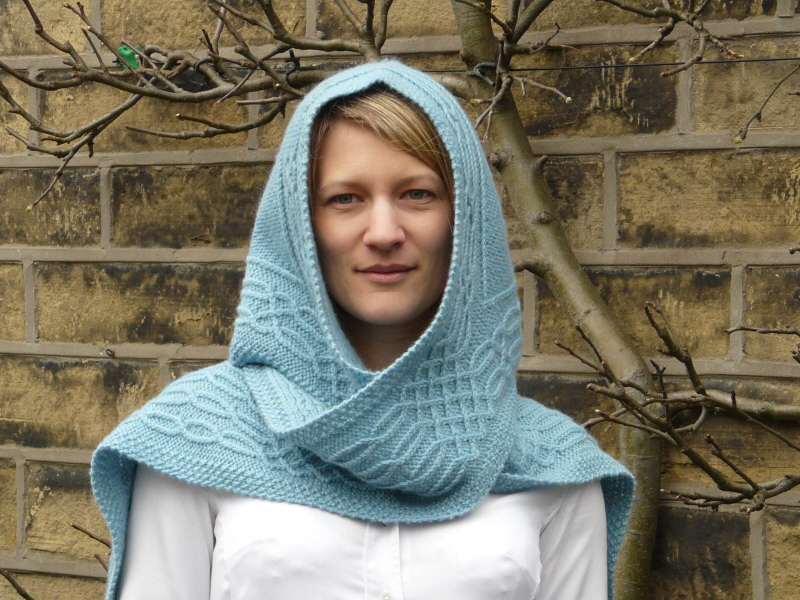 The scarf is knitted from one end to the other in one piece, with the hood formed from ‘short rows’. 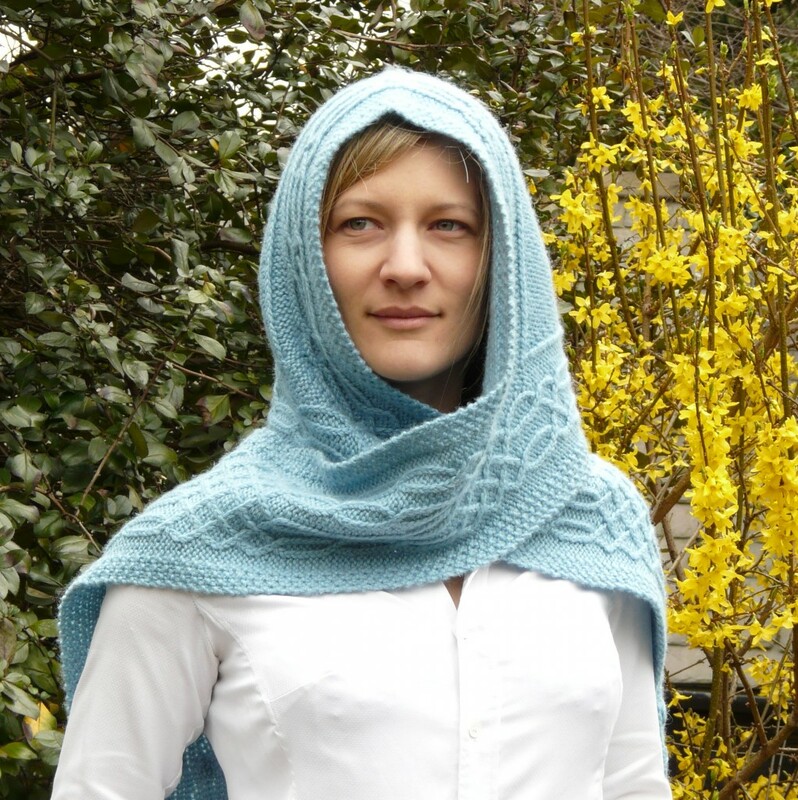 Intermediate to advanced knitters will enjoy the varied stitch patterns in this project. The pattern is supported by a linked video tutorial for the unique increase used near the bottom of the scarf tails. Full written instructions are included, supported by clearly presented charts for all the cables. You will need 5mm/US 8 needles, or size required to get the required tension/gauge of 18 stitches and 22 rows per 10cm/4″ in stocking stitch. The yarn used for the pictured sample is ‘Airedale Aran’ from Texere Yarns. This is a light aran, equivalent to a US worsted weight yarn, with which it can be substituted. You will need from 420 – 560 metres (459 – 612 yards). The large meterage/yardage range allows for the wide variance in cabling tension from one knitter to another. Although this original design is inspired by the fiction of JRR Tolkien, the pattern is not official or licensed merchandise and should not be perceived as such. Lanthir Lamath is also available in ‘Novel Knits’ (see ‘Books’). I have been knitting this for the last few years (nothing to do with the pattern just my knitting speed) and I love it – This was my first ever knitting project and I think it’s a brilliant intro to cables although I needed help on the lifted increases.